As you get older, you may find your eyesight has diminished. But there are natural ways to combat this age-related decline, and one such method is to implement a well-balanced diet with healthy foods for eye health. A diet high in vitamins, minerals, and antioxidants can prevent a wide range of eye conditions, including glaucoma, cataracts, poor night vision, dry eyes, and age-related macular degeneration. Nutrients your body needs for eye protection include omega-3 fatty acids, beta-carotene, lutein, zeaxanthin, vitamin A, vitamin C, vitamin E, and zinc. There are many foods good for eye health. In this article, we will detail diet and lifestyle tips and specific foods to eat for vision improvement and eye protection. Consume more whole grains and fiber-rich cereals. Remember, the added sugars that are commonly found in refined breads and cereal can increase your risk of obtaining age-related eye diseases in the future. Instead, consume 100% whole grain breads and cereals that contain loads of fiber—this will slow down the absorption of carbs in your digestive system and will therefore have minimal effects on your blood sugar levels. Diets that are high in saturated fats and sugar have been proven to increase the risk of severe eye diseases; however, if you consume a healthy dose of fruits and vegetables, most specifically greens and fruits, you can aid in preventing eye diseases and other significant health problems. To protect your eyes, you should consume five to nine servings daily of fruits and vegetables that are high in antioxidants—this will reduce the damage that certain oxidizing agents cause to the eyes. Vitamin A is another nutrient that is essential for healthy vision. It can be found in many fruits and veggies, including oranges, carrots, and squash. Studies show that people who follow diets that are rich in omega-3 fatty acids, healthy proteins, minerals, and vitamins have a decreased risk of developing certain eye conditions, such as cataracts (clouding of the eyes). Omega-3 fatty acids are the healthy fats that the body needs and are commonly found in flaxseed oil, walnuts, wild-caught fish, and canola oil. They can help prevent cataracts and dry eyes. When you are outside enjoying a nice summer day, keep in mind that that’s when the UV rays are at their peak and can be detrimental to the eyes. That is why it is important to consume foods high in lutein and zeaxanthin. These nutrients are plant pigments called carotenoids and have been known to protect the retina from oxidized changes that are caused by the sun’s UV rays. Spinach and kale contain high amounts of lutein and zeaxanthin. Did you know that consuming high doses of sodium can increase the risk of developing cataracts? I wouldn’t recommend consuming more than 2,000 milligrams of sodium each day. Dehydration can have a negative impact on your eyes—your eyes can become extremely dry, which can lead to cataracts in many cases. Consume eight glasses of water (eight ounces each) on a daily basis, along with healthy beverages such as skim milk (which provides calcium) or 100% vegetable juice. Your diet should avoid processed foods and contain the above foods for eye health, such as fruits, vegetables, and lean protein like wild-caught fish and organic eggs. But you may want to know more about what specific foods to eat for eye health. Wild-caught fish, and particularly salmon, is great for eye health because it contains omega-3 fatty acids, which prevent dry eyes and contribute to overall eye health. As a result, wild-caught fish consumption can help relieve dry eye syndrome and age-related macular degeneration symptoms. Omega-3 fatty acids can also reduce the risk of glaucoma and high eye pressure (ocular hypertension) and improve the drainage of intraocular fluid from the eyes. Fish can be grilled, baked, or broiled. It also tastes delicious with lemon juice, salt and pepper, and fresh herbs like dill. Eggs are delicious, nutritious, and have so many amazing health benefits. They are loaded with vitamin A, zinc, lutein, and zeaxanthin. Zeaxanthin and lutein will lower your risk of eye diseases like glaucoma and age-related macular degeneration. At the same time, vitamin A will protect the surface of the eye, called the cornea, while zinc benefits the back of the eye, called the retina. When buying eggs, make sure they are free-range and organic—avoid cage-raised eggs whenever possible. Free-range eggs contain more beta-carotene, vitamin A, and vitamin E.
Eggs are great at any time of day, and can be added to salads or sandwiches when hard-boiled. While most people know carrots for their signature orange color, they actually come in shades of white, yellow, red, and purple as well. Carrots get their color from carotenoids like beta-carotene—the precursor of vitamin A. A lack of vitamin A can lead to age-related macular degeneration and night blindness. Carrots also contain a considerable amount of zeaxanthin and lutein, which, again, can reduce the risk of age-related vision loss. Carrots are great in salads, soups, and even juice. Another great food for eye health is kale, along with other dark leafy greens like spinach, collard greens, and Swiss chard. These dark green leafy vegetables also contain zeaxanthin and lutein, which makes them useful in preventing cataracts and age-related macular degeneration. Zeaxanthin and lutein act like antioxidants in the eye, filtering away harmful blue wavelengths of light in your eyes. Kale also contains important eye health nutrients such as vitamin A and vitamin C.
How can you enjoy kale? Wash the leaves and tear them into bite-sized pieces for kale chips, sauté them, or toss them into a salad. Vitamin C is a key eye health nutrient found in oranges and other citrus fruits like lemons, limes, and grapefruit. Vitamin C can help prevent the development of cataracts and age-related macular degeneration. It’s a nutrient the body needs to make the healthy blood vessels and connective tissues in your eyes. Oranges can be peeled and enjoyed as a snack, added to a salad, or freshly juiced. Vitamin E is another important eye health nutrient found in almonds and other tree nuts, including walnuts, cashews, hazelnuts, and Brazil nuts. Regular consumption of vitamin E-rich nuts can help prevent both cataracts and age-related macular degeneration. Almonds and other nuts can be enjoyed anytime as a snack, or they can be added to salads and smoothies. Nuts are also great for pesto sauces. Vitamin E content is also high in sunflower seeds and other seeds such as flaxseed, sesame seeds, and pumpkin seeds. Sunflower seeds, in particular, contain more than 90% of the recommended daily value of vitamin E, which can prevent cataracts and slow the progression of age-related macular degeneration. Sunflower seeds and others can be eaten as a snack or added to salads, smoothies, pesto sauces, or salad dressings. Bell peppers come in a variety of colors, including red, green, yellow, orange, and purple. They are extremely high in antioxidants like vitamin A, vitamin C, lutein, and zeaxanthin. All of these antioxidants benefit your eye health. We’ve noted that lutein and zeaxanthin can prevent age-related macular degeneration and cataracts, but they can also improve vision in those with existing cataracts. These antioxidants can also reduce light and glare sensitivity and decrease eye fatigue. Enjoy bell peppers raw in salads or dip them in hummus or bean dip. Zinc is a significant nutrient for eye health found in lentils and other legumes, such as black beans, chickpeas, and kidney beans. Zinc is able to delay the progression of vision loss and age-related macular degeneration. Lentils and other legumes are great in soup, dips, and casseroles. Orange-colored foods like carrots and sweet potatoes are high in vitamin A precursor beta-carotene, which is essential for eye health, and especially for slowing the progression of age-related macular degeneration. A vitamin A deficiency can lead to vision loss, night blindness, dry eyes, and a buildup of keratin on the conjunctiva of the eye. Sweet potatoes also contain other eye health nutrients, such as vitamin C, vitamin E, and zinc. Avoid smoking: As if you needed another reason to quit smoking—research has shown that those who smoke have a greater risk of developing cataracts at a later age. Have your eyes examined: Depending on the condition of your eyes, it is recommended that you have your eyes checked once every two years. This goes for individuals of all ages. A proper eye exam can detect certain eye diseases, such as diabetic retinopathy—a diabetic eye disease that is one of the leading causes of blindness. For those who wear prescription eye glasses, an eye exam will ensure that you have the proper lenses to match your eyesight. Watch for vision changes: If you begin to see a drastic change in your vision, it is recommended that you consult your doctor immediately. Early signs of vision deficiency could include double vision, hazy vision, and issues seeing in low-lighting conditions. In addition, you should also consult your doctor if you experience these other eye problems: eye pain, flashes of light, and/or swelling. Wear protective eyewear: Make sure you wear protective eyewear when gardening; using chemicals or power tools; doing home maintenance or renovations; playing sports like cycling, football, or cricket; or as a requirement of your job if you work in a factory or handle heavy machinery or equipment. Clean your hands and contact lenses properly: Always wash your hands before putting in or taking out your contact lenses. Be sure to disinfect your contact lenses as the instructions indicate, and replace them at the appropriate time. Wear sunglasses: Protect your eyes from the sun’s UV rays with sunglasses when outside. UV light can lead to eye damage and conditions like cataracts. Maintain a healthy weight: Being obese or overweight can increase the risk of diabetes and related ocular complications, including glaucoma, vision loss, and diabetic retinopathy. For weight loss, follow a healthy diet and a regular exercise routine. Give your eyes a break: Take regular breaks if you spend a lot of time on the computer. Staring at the computer can lead to tired eyes, digital eyestrain, and long-term vision damage. To take a break, try the 20-20-20 rule. This is where every 20 minutes you look 20 feet away for about 20 seconds. This method can help reduce eyestrain and relax your eye muscles. 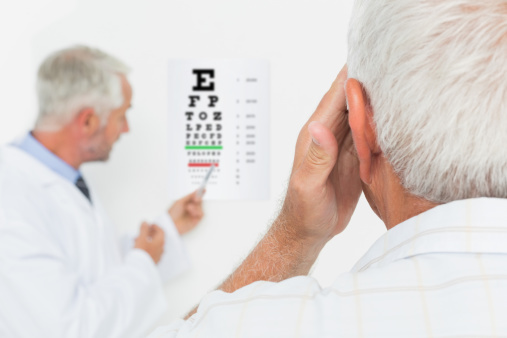 With age, you may be at higher risk of eye conditions such as age-related macular degeneration, dry eyes, cataracts, glaucoma, and poor night vision. Consequently, it is a good idea to consume the right foods for eye health.In this article, we detailed specific foods for eye health, including salmon and other wild-caught fish, organic eggs, carrots, kale and dark green leafy vegetables, oranges and citrus fruits, almonds and other nuts, sunflower seeds and other seeds, bell peppers, lentils and other legumes, and sweet potatoes. Nutrients found in these foods are beneficial for eye health, and include vitamin A, vitamin C, vitamin E, beta-carotene, zinc, zeaxanthin, lutein, and omega-3 fatty acids. >Jegtvig, S., “How To Boost Your Diet and Nutrition to Protect Aging Eyes,” AllAboutVision.com; http://www.allaboutvision.com/over60/nutrition.htm, last accessed May 21, 2015. Schwartz, P.S., “Eight Ways to Protect Your Eyesight,” Peter S. Schwartz, MD web site; http://www.peterschwartzmd.com/eight-ways-to-protect-your-eyesight, last accessed May 21, 2015. Rodriques, A., “11 Foods to Boost Your Eye Health,” All About Vision; https://www.allaboutvision.com/nutrition/foods.htm, last accessed September 12, 2018. “Zinc,” National Institutes of Health; https://ods.od.nih.gov/factsheets/Zinc-HealthProfessional/, last accessed September 12, 2018. “Simple Tips for Healthy Eyes,” National Eye Institute; https://nei.nih.gov/healthyeyes/eyehealthtips, last accessed September 12, 2018. “10 tips for good eye health,” Better Health Channel; https://www.betterhealth.vic.gov.au/health/ten-tips/10-tips-for-good-eye-health, last accessed September 12, 2018.